Gardeners who work on a compost pile with yard waste, kitchen scraps and other organic ingredients can anticipate a beneficial blend of black compost to use to enhance their soil. Once you begin a compost pile, your task becomes adding both green and brown materials to it to create the compost. Brown materials include dried leaves, newspapers, sawdust and straw. Green materials include grass clippings, discarded plants, coffee grounds and kitchen scraps. 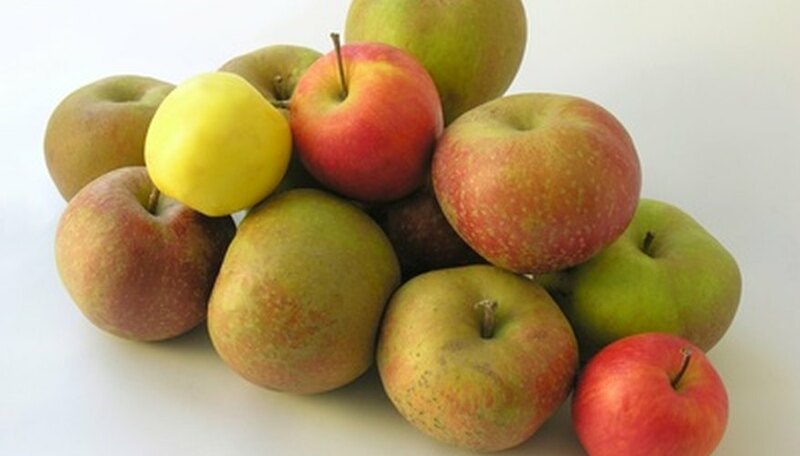 Many gardeners like to compost apples in their compost piles as a part of their green materials. Chop up old and inedible apples into small chunks to speed the decomposition of the apples, if you desire. Chopping is optional, and you can also add whole apples to the compost bin, if you prefer. Store the apples in a covered bucket with any other kitchen scraps you are waiting to compost. Wait to add the apples and other scraps until you have enough to make a layer between 3 and 4 inches high in the compost pile. When you collect enough green materials, add them all at one time to create your green layer. Add the apples and any other green materials over the top of the compost pile to create the layer. Add a layer of brown materials over the green materials immediately. Never leave green materials as the topmost layer in a compost pile because it will attract unwanted insects and pests. By sealing the green materials beneath a layer of brown materials, you also reduce odors in your compost bin. Make the layer of brown materials approximately the same size as the green materials.